It's time for a new go-kart! TinyCross chassis and single corner module. The design follows the water jet-cut plate and 80/20 construction that's been my go-to for rapid and adjustable construction. 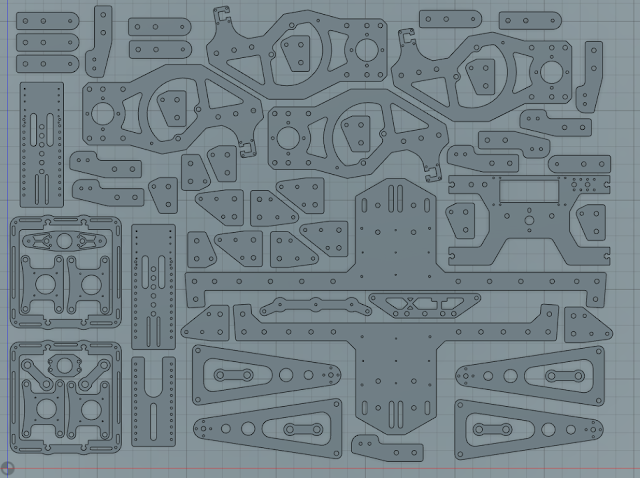 There are still a few machined parts, mostly turned shafts, but a large portion of the chassis can just be "printed" on a couple sheets of aluminum. The 0.25in aluminum plate components to be cut. Long-time readers may recognize that I've switched over to new CAD software. The days of free SolidWorks are over, so I'm using Fusion 360 now. Rather than arguing with people about the best ECAD/MCAD software, I tend to just try the different packages until I understand their fundamental strengths and weaknesses. 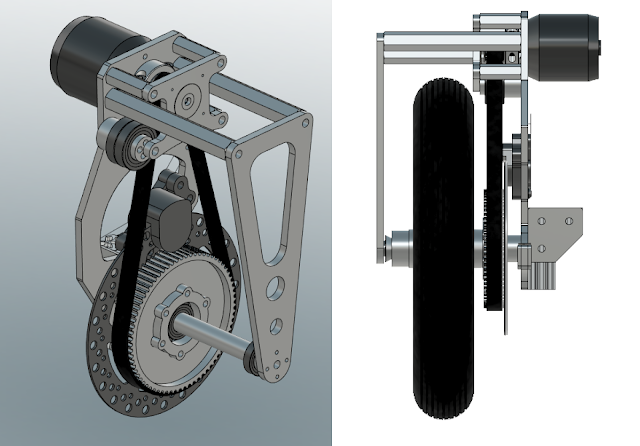 I've got maybe 100 hours in Fusion 360 now and the biggest difference to SolidWorks I've noticed is the assembly constraint framework: SolidWorks "mates" are refined, purposeful, and user-friendly. The "Width Mate", for example, is sublime. Fusion 360 "joints" are raw and don't inherently guide you to the good practice of constraining your CAD the same way as your real assembly. But, they have a general flexibility that I find very powerful and time-saving. Drive block with motor and brakes. The powertrain is entirely contained in a ~4kg block that is repeated in each of the four corners. It uses the same motors as tinyKart, Alien Power System 6374-170 outrunners, but with different gearing for the larger 12.5in scooter wheels. With four of them, I expect around 8-10kW peak output. I've carried over the offset bearing belt tensioner that worked so well on tinyKart. The brakes are the same as well, but I managed to fit the caliper in the middle of the belt loop to keep everything in-line. Front suspension and steering geometry. 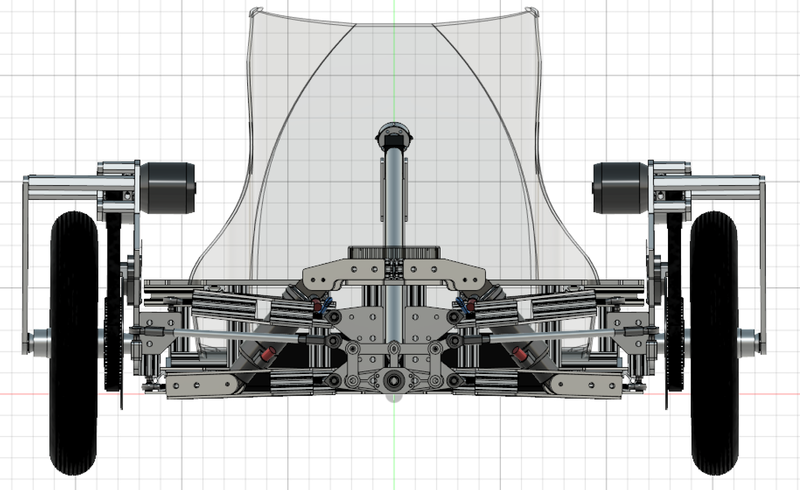 Suspension separates a crosskart from a go-kart in my mind. I wanted something that can handle speed bumps, potholes, gravel, dirt, snow, and other surfaces that would (and did) tear tinyKart apart. Now, I don't have any experience designing vehicle suspension, so I took a reasonable first guess on the geometry but left room for tweaking later. The shocks are mountain bike air shocks, which are both very light and easily adjustable. The total suspension travel is about 5in. Because the suspension takes up so much space, I wound up moving the steering linkage to the very front of the kart to make more legroom. This turned out to be a major headache since the Ackermann geometry is backwards. I was able to get back to a reasonable geometry by using a slightly more complex linkage. Minimizing bump steer from suspension travel was also an interesting new challenge for me. Box chassis to add a little stiffness. 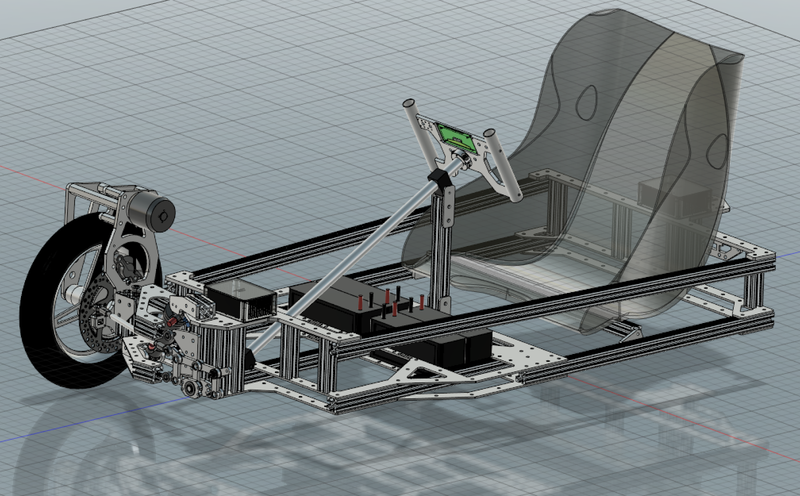 tinyKart's chassis was truly flat-packable, but as a result it twisted a lot. This actually worked in its favor somewhat, keeping all four wheels on the ground in lieu of suspension. 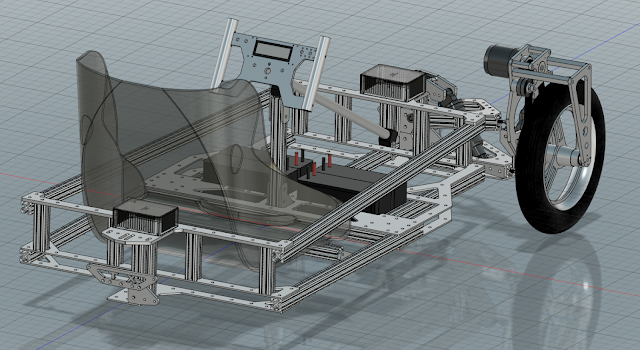 But here, I was willing to go vertical and make a bit more of a box structure to keep the chassis stiff. Note that there are many stiffening spacers between the thinner bottom plates that I've left out of the model to keep the assembly smaller. I still want to be able to separate the chassis into front an rear sections for transport with as few fasteners as possible. Removing the two side rails and then sliding the rear chassis out of the front chassis plate sandwich seems reasonable. I've settled on motors and batteries (12S/20Ah LiPo), but haven't started any of the controller work yet. I'd like to do an update version of the 3ph "Duo" v2.1 controller, one in front and one in back, but based on the newer IXYS MTI200WX75GD-SMD, which is a pretty awesome little part. I need to run the math though, since the original design was never meant for these power levels. I'm also planning a simple board for the steering wheel, to host a display, trigger throttle, and some knobs or switches for quick setup. Not sure how far I will dive into independent torque control, but I do plan to link everything together with CAN to leave that possibility open. I'm shooting for about 34kg / 75lb for the kart without batteries. With the full 12S/20Ah it will be about 40kg / 88lbs. This is about 50% heavier than tinyKart, but still light enough to manipulate up onto a table to work on, or into a vehicle for transport. Plus, most of the weight of a go-kart is the rider, so with double the power it should have plenty of acceleration to spare. Parts should be coming in this week so next post will have some real pictures!